Is my baby’s weight right for his/ her age? Why is my baby not chubby? Is my baby eating enough? Ever asked yourself any of the above questions? I know I have. 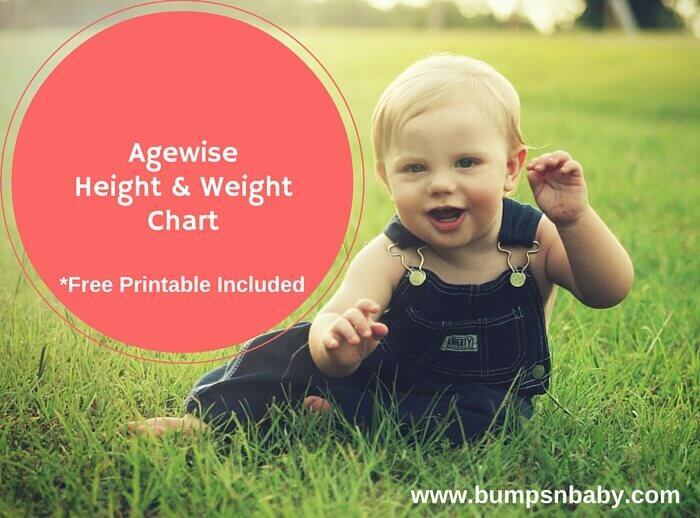 Today I bring to you the agewise height and weight chart for babies, toddlers and kids. Weight of your baby! This is a very common worry for almost all moms. Every time I go to the pediatrician, I make it a point to ask him to weigh my daughter, measure her height and check her head circumference. Despite assurances by my pediatrician, I get worried from time to time regarding my little one’s height and weight. Don’t call me paranoid because I am sure there are many more moms like me, who are concerned about their baby’s height and weight gain. That is why I have come up with this post gives you an age wise height and weight chart for babies and kids. When I had gone to the pediatrician for Anshika’s hand, foot and mouth disease, the token we got was number 6. Now that could take a lot of time as the doctor had gone for rounds in the maternity ward. I was really worried and wanted to calm myself. So I looked around. There were moms, dads, feverish babies, babies with cough and cold, babies due for vaccination and some naughty toddlers shouting at the top of their lungs. I entertained all the babies by making faces at them. They in turn rewarded me with their adorable smiles! You can also read 5 tricks to keep cold and cough at bay. Time passed by, but doctor didn’t come. But by now I was calm enough but bored and needed something to read. So I started looking around. My eyes wandered through the various charts, posters and notifications on the walls. Voila! My gaze got stuck on one particular chart- the age wise height and weight chart for babies and kids. Just what I needed to see! That’s when the blogger in me took over. I took photos of the chart, thinking that I could write about it and share with all you mommas, who are in the same boat as I am. Why is my baby losing/ not gaining weight? Keep in mind that each baby / kid is different and has different developmental phases. As long as your baby is active and healthy, there is no need to panic if he/she is not weighing as per this chart. Pre- term babies or premies tend to have lower weight and a slower weight gain than their full term counter parts. So if your child is a pre-term baby, ask your pediatrician for guidance in terms of his/ her weight and height. Bottle fed babies usually have no issues catching up with the weight milestones, this is because they don’t lose weight in the initial days like the breast fed babies. Girls and boys have different milestones when it comes to height and weight. Yes, that’s right, the average weight for babies varies according to the gender. Babies above 8 months of age generally tend to lose weight as their activities increase and they tend to have a constant weight / lose weight as they grow older. Babies/ kids suffering from fever could lose weight, so there could be a difference there as well. Not just that, there are several other reasons for a baby to lose weight. The genes inherited by the baby can play and important role in the physical constitution of your child. If anyone from your or hubby’s family (maternal/paternal) is on the leaner side, your baby could be on the leaner side too. Read more about 10 reasons why babies tend to lose weight. And if you are worried about your child not gaining weight, make sure you are not making these 3 common mistakes. You can also read whether worm infection can cause weight loss in babies and kids. Are there foods to help in weight gain of babies, toddlers and kids? Yes! Kids are a bundle of energy. And to power them up you need foods that abound in calories, vitamins, minerals and everything healthy. Read more about the Top 15 foods for weight gain in babies. Now you know that healthy food doesn’t mean that your kid will want to eat it. So try these simple tactics to make your mealtimes fuss free. And if you feel that your kid is not eating properly because of lack of appetite, fret not, for we have a solution for that as well. Check out these 12 foods that can help your child increase his/her appetite. You can also download the free printable weekly food planner for your tot and ensure he/ she is getting the required amount of nutrients required. Why do you need to consult a chart? How many of you have been ridiculed by your parents regarding your baby’s weight? Let’s face it, the grandparents will always think that your little one is too weak and thin. This holds true not just for your kids but you too! You may be bursting at the seams but your parents and grandparents will think that you are competing with a twig! So with all that, it is normal to feel tensed about your baby’s weight and height. That’s why you have these charts. They provide you with an unbiased estimate of your baby’s height and weight as per his/ her age. Apart from that, a growth chart will help you understand if your baby is healthy and is achieving his weight and height milestones. While it is great to have a ready reckoner regarding your child’s weight and height, it has caused sleepless nights for mommies as well. They end up following the chart blindly and end up worrying if the values don’t match. I know this because I once refused to believe my pediatrician when he told me my daughter was healthy. When asked for the reason I told him about the chart. Imagine two people travelling separately, using a map to go from point A to point B. How fast will they reach the destination? For knowing that won’t you consider variables like the mode of transport, speed of travel etc before you determine the speed? Similarly we have variables when it comes to determining a baby’s height and weight requirement according to his/her age. Do remember, the charts available provide you with an estimated height- weight as per the standards. While it can be used as a guideline, please don’t go by the exact weight and height for your baby / toddler / kid as mentioned in the chart. One last thing before you download the chart. It is important to be realistic when it comes to your child’s weight. But how do you do that? Keep your baby’s birth weight in mind before you set weight goals for your child. Do not just concentrate on the weight aspect, ensure he/ she is growing too. A lot of us make the mistake of ignoring the average height by age. It is important that your baby is maintaining the correct height to weight ratio or you may be making your kid obese rather than healthy. And let us not forget the genes, they too play a vital role in determining your baby’s height and weight! Finally, what you have been waiting for, the age wise height and weight chart for your little munchkin. Raising a kid means dealing with a million queries and worries, so let me take one worry off your plate. 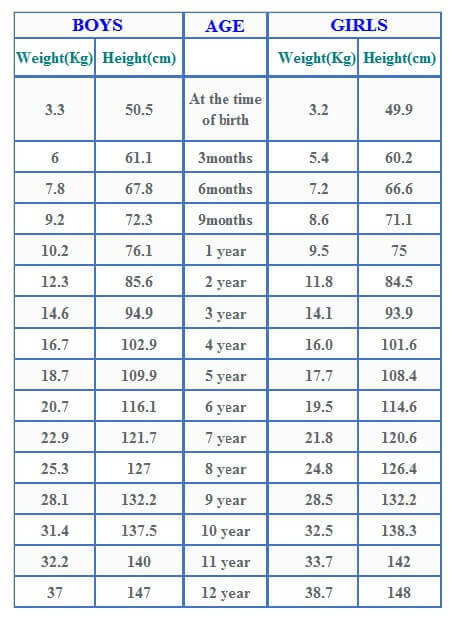 This chart has the average weight and height for babies as per their ages. I have included a downloadable chart for you as well. So any time someone comes to you with the all too familiar,”Aww, your baby looks so thin/weak” comment, all you have to do is take a deep breath and consult the chart and put your fears to rest. This is an estimated chart as per the WHO standards. Do not go by the exact weight and height for your baby / toddler / kid as mentioned in the chart. Make sure you have considered all the variables above before consulting the chart. If your baby is underweight or overweight, please consult your pediatrician and if he asks you to just relax, then it is a sign that your baby / kid is super healthy. Dear mommies, Hope this article on agewise height and weight chart for babies and toddlers was informative and helpful. I do also hope that I have provided answers to at least some of the questions you have regarding height and weight gain. If you are still worried about your kiddo, do ask your pediatrician during your next visit. And if you have more questions for me, you know what to do. Just ask! Write to us with all your comments and queries. It is as simple as that. And if you have any tried and tested recipes/ food that has helped your kiddo gain weight, share them with us! Am working mother of 18 month old girl baby. My main concern is she is still 7.6kg and not gaining weight. She is taken care by my in laws and she is very choosy when it comes to food. My baby is active and reaching all milestones but height and weight is not as per the age when compared to other babies of her same age. Kindly suggest me how to increase her weight. My baby’s birth weight was 2.6 kg,I see the chart begins with only 3.3kg. Can you provide chart from 2.5kg babies? My baby is 1 year 0 months old. His weight is only 9 kg. He is a very fussy eater. Added to that another problem is constipation. I am still breast feeding the baby. Kindly advise how to increase his weight . Hi sangeetha ! I am a mom of one baby , aged 2 years 4 months old. my baby too under weight of 7.8. I am much worried .but she is active, attentive. Pls do help e out. Rekha, other than being cautious about cleaning leafy greens well and avoiding outside foods, you can give almost anything your kid wants to have. Hi sangeetha ! Nice job u r doing. I am a mom of two daughters one aged 6 years and the little one 15months old. Elder daughter too under weight of 16 n little one 8. I am much worried on both.but both r active, attentive, an all usr lose in weight. And I I’ve got fed up of giving replies to my elderones n relatives n friends. Although I y2k cr of them to the extent wat I can. Pls do help e out. My princess is now nine months her birth weight is 2.8kg now 6.8.She is very lean .How could I improve her weight?and one more question is while she was born very fair but now her skin tone getting darker.How can I get my baby faired.It will make my baby inferiority in future.So pls give best solution for this. Give her food chart to me with timings and activities, I will check. Complexion of a baby is mainly determined by genes. Hi Sangeetha! Very useful and informative blog…I downloaded bumps and baby app…It’s really helping. I have a 9 month old daughter. She is active but toll now she dint start to sit by herself not even crawling. That’s really making me worried. She is also a fussy eater. Doc said as long as she is active nothing to worry. Ur blog iss really helpful but the charts are not visible completely..
Will definitely work on the charts visibility Vijitha. Yes do not worry about her sitting or crawling. Each baby is different so are the milestones. Its fine if she doesnt drink milk. You can give her paneer, curd, yogurt, cheese anything which can replace the nutrients of milk in her diet. To increase her weight, start following a food chart and give calorie rich foods in it like eggs, khichdi with ghee, ragi halwa, moong dal cheela with ghee, cheese paratha etc. Madam,, My baby is a fusy eater, now she is 17 months and weighs 8.2kg and height 72 cm. her birth weight was 2.35kg. Pls advice how to increase her weight. Always give him boiled raisin water. Stop banana, ragi and sago for a while and start all over again one by one. Make sure he eats oats and pears everyday. He will be relieved. My son is 10 month 1 week old, he weighs only 7 Kgs. Everyone ask me why he is so thin, even I feel the same. But he is active, he eats only porridges, he don’t like fruits. sweet porridges, what can I do for his weight gain? A baby’s physical appearance depends entirely on his genes. So dont worry if he is thin, if he is happy and active theres nothing to be worried about. However you can puree the fruits and add in his porridges n mashes. My daughter is 17 mnths old and weighs around 8kgs . She doesnt wants to eat at all, i forcefully have to feed her, can you provide me with a food chart for her as we are purely vegetarians. I am seriously concerned with her weight and growth pattern. Rajnis, Try this food chart : http://www.bumpsnbaby.com/free-printable-food-chart-2-year-old/ Replace non veg with paneer, mushroom or any other veggies you like. Hello mam, my baby is 2 year old.. he is lactose intolerence baby.his weight is 8 kg and height is 80 cm.please help me tp incresae his weight. Hi, My daughter is 11 months old. She is 7.7 kgs .. her birth weight was 3.2 kgs only. Though she is active, she does not eat enough.. we are not able to force her too.. Is there a natural way to boost her apitite. Kindly suggest me some tips to increase her appetite. Give hing in her foods. If you give buttermilk / curd add hing / powdered ajwain to it. Her weight is ok, just make sure she is fed a lot of variety to her food chart. My daughter is 17 months old and her weight is 9.2kg only, She s not interested in eating , even if she eats she will have only 10 spoons. Her weight gain is very slow and steady . her birth weight is 2.9kg. Hi, My daughter is 19 months old. She is 9.3 kgs and she is about 75 cms heigh. her birth weight was 2.7 kgs only. Though she is active, when she is sick she is very dull and weak all the time.. she does not eat anything if she is not in the mood to have.. even if she takes food not more than 10 spoons.. we are not able to force her too.. Is there a natural way to boost her apitite. During lunch time give her a glass of butter milk with hing and a pinch of salt. It helps to improve the digestion. 10 spoons of food is good for a 19 month old. Once she starts her schooling and stuff she will start eating properly trust me .. Dont worry as of now ..
Share her food chart with me if you can.. Let me see..
ragi is ‘nachni’ Sana .. Yes her weight is ok .. You should provide high calorie foods for her. She will put on weight..dont worry..
Hi, my son is abt to be 12yrs old and his height is 5.5″. is it a normal height? i am slightly worried. he has always been bigger than his age. he was born 49 cm tall. How tall he will befurther? Is anyone in your or hubby’s family having taller genes ? If yes it could be the genes playing the part.